My Friday Finds today are long overdue. Marilyn at The Cutest Cottage Lamps had a give-away in June. She makes the most fantastic lampshades. Her designs and the way she puts fabrics together amaze me. I entered her drawing and I won. I could hardly believe it when she emailed to tell me that a package would soon be on its way to me. Just a few days later it was here. I could hardly wait to open it. Just inside was the sweetest note from Marilyn. Before I read it I knew it would be special just by her choice of stationery. What a dear letter. From her heart to mine. But that was only the beginning. When I started to unwrap what was inside I could hardly catch my breath. I stood here saying, 'Oh - oh- oh'. It was all I could say. The lampshade was more beautiful than I imagined. Her workmanship is exquisite and the way she put it all together is incredible. It's just perfect! Then I unwrapped the sweet little lamp. Oh my! I absolutely fell in love with it. I really hoped to win this lamp because the little people represent parts of my life. It's so 'ME'. I took a few years of violin lessons when I was young and the violin is still very dear to my heart. And the old-fashioned girl in a pretty dress. Flowers in her hand. It just captures my fancy. It's so romantic! When I put them together, I stood back and smiled. A lot! What a wonderful treasure from a dear blog friend. Marilyn and I hope to meet one of these days soon. She lives in my state. Not too far from family. When we meet I know there will be hugs and smiles. When we do I promise to share our time together with you. Thank you, dear Marilyn. Words can't express what my heart feels every time I look at this sweet lamp that is a reminder of you. 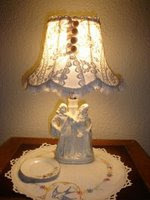 You will see where this little lamp has found a home when I finish the redo of my office/sewing room. Hopefully that won't be long. It will get done. One step at a time. So gorgeous! It will simply be beautful in your sewing studio. Two treasures! They will look beautiful in your home. I've just been catching up on your last sevral posts. Your new lamp is simply stunning and your birthday treasures are all wonderful and special. I only wish I lived close enough to join you for the Gaither's concert. Hope your dear little mama continues to improve. I know she misses your little outings and adventures.